Executing a successful trip can be a complicated process. You have to arrange plans with your business travel agency, make sure your pets are taken care of, and organize your schedule for while your away. To make sure all things go according to plan, you’re going to need as much extra time as you can make available. One of the best ways to ease the tension of short and lengthy trips is by efficiently doing the small things. You’d be surprised by how much time, money, and hassle you can save yourself while packing your bags. Follow these tips, and you’ll be packing like a pro in no time. You know this situation all too well — it’s late the night before a flight, and you throw all your stuff into a bag so you can get to bed before an early flight. Sometimes life happens, and this will be your only option, but making a list before packing will help save you time and money upon arrival. After frantic packing, you might find yourself in the hotel room wondering where your socks are or why you didn’t pack a toothbrush. Consequently, you either have to go to the front lobby or down the street to a convenience store and spend valuable time and money replacing items you already own. Make a detailed list of all your trip needs and double check it to avoid an extra shopping trip upon unpacking at your destination. There is always a temptation when traveling to pack as much stuff as possible to make sure you have a lot of options. However, minimalizing can decrease your time in the airport. If you make the previously stated list, it is easy to plan your outfits out and not need extra clothes. This preparation will often allow you to get by with just a carry-on and personal bag instead of lugging around a clunky suitcase. Skipping the baggage-check line can save you hours over the course of a trip. Plus, you’ll avoid extra baggage fees. One of the best ways to fit everything into a carry-on or utilize the space in your suitcase is to pack your bag effectively. Most travel experts agree that rolling your clothing is one of the best methods. It takes up less space and decreases the risk for wrinkles and creases. Another great alternative is using compression bags for your contents. These containers will vacuum seal all your items. This process shrinks the items as small as possible, and the packaging is very easy to stack and organize. In addition, if for some reason your luggage is exposed to rain or a ruptured hygiene product, your items will be protected by the compression bag. 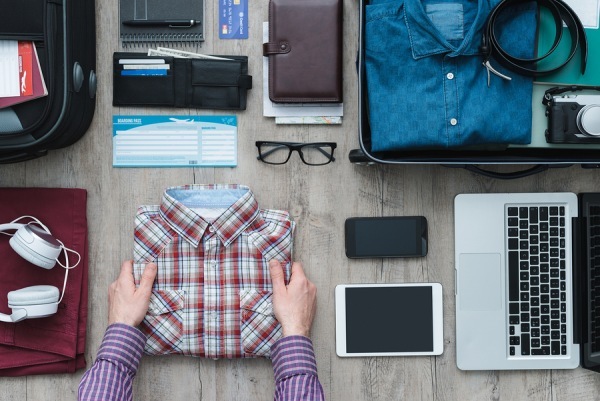 Make travel easier by minimizing the stress of preparation with these simple packing tips. If you need more travel tips or want to make a business trip even easier, Teplis has been an expert in the travel industry for over forty years. We’d love to make the contents of your luggage the biggest travel concern on your next flight. Contact us to become a Teplis corporate travel client today!